Most people will never make the necessary changes to improve their health. In fact, a recent study published by Journal of the American Medical found that less than half of people who had a heart attack or stroke made any meaningful changes to their lifestyle. And just 4.3% made all of the changes recommended by their doctor. One of the biggest reasons why we don’t make changes in our lives is that even though we know we should, we simply don’t know.When you think about it, it’s shocking to realize the only thing holding many of us back from living healthier lives is a lack of knowledge. That realization has spurred me to do something about it in any way I can – and it’s why I so strongly support the new Ultimate Healthy Living Bundle (2016 Edition) from the Ultimate Bundles Team. 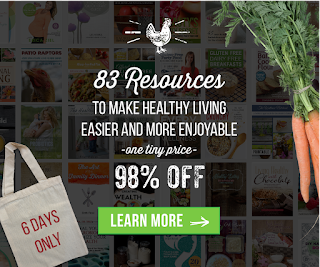 It’s a curated collection of 83 eBooks and eCourses on healthy living from the finest mentors out there.